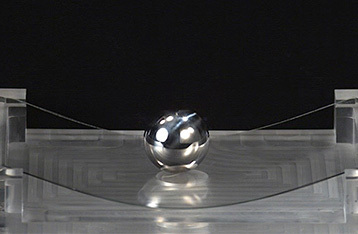 When a steel ball is dropped on a sheet of Dinorex to test its strength, the ball bounces off and the glass does not break. We live in an age when smartphones and tablets are ubiquitous. The technology of computer devices is rapidly advancing and revolutionizing our lifestyles. Large-screen displays and personal computers increasingly use touch-panel technology, and wearable computers such as watches and glasses are becoming more common. Cover glass must protect device screens while allowing smooth operation at the touch of a fingertip, without compromising image quality. It has to be highly shock resistant to protect these valuable items against breakage when dropped and scratches through use. At Nippon Electric Glass, we have developed a glass for chemical strengthening that is ideal for display screens and is already widely sought for a range of uses. Read on to learn more about this wonderful new material. 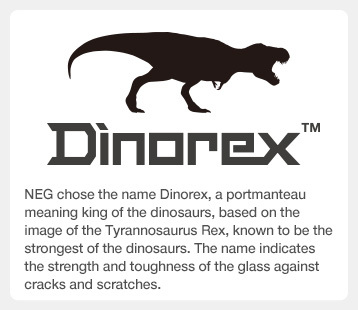 Dinorex™ is NEG’s new brand name for its T2X series of glass for chemical strengthening, including T2X-0 and T2X-1. Dinorex™ glass for chemical strengthening protects smartphone and tablet screens. 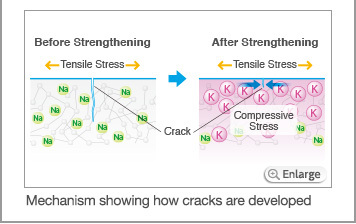 What exactly is glass for chemical strengthening? The answer lies in the mysteries of science. 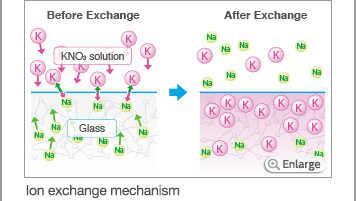 When glass containing sodium ions (Na+) is soaked in a potassium nitrate solution containing potassium ions (K+), the Na+ on the glass surface change places with the K+ in the solution. 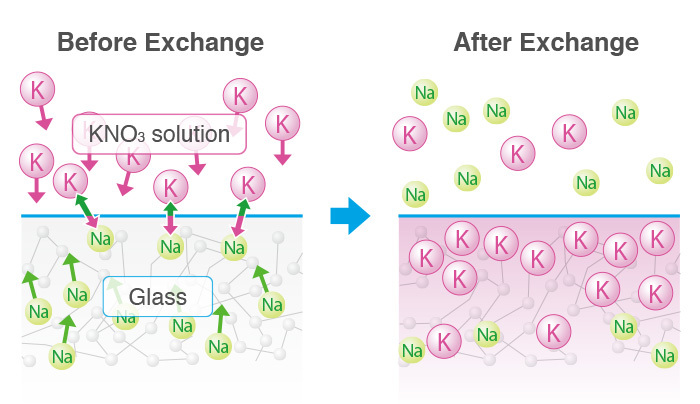 This process is called ion exchange. 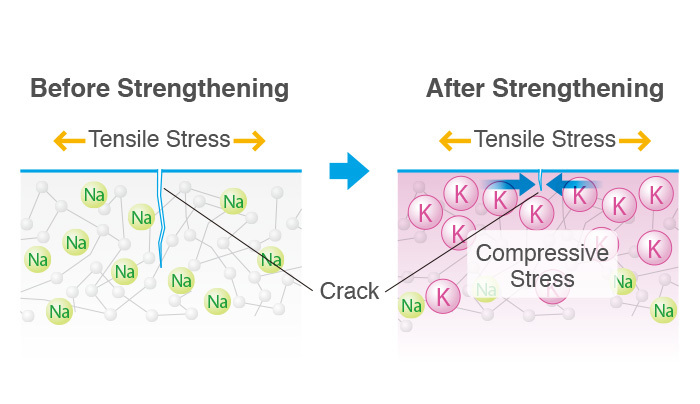 The K+ have a larger diameter than the Na+ and exert compressive stress on the glass surface. 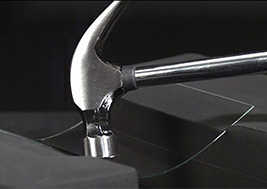 This strengthens the glass enough to withstand a hammer blow without breaking. When large-diameter K+ change places with small-diameter Na+ on the surface of a glass sheet, the larger ions are squeezed into a small space. As they try to expand, they expand the volume of the glass surface.Of course, the actual volume of the glass does not change, so the ions are compressed to fit on the glass. 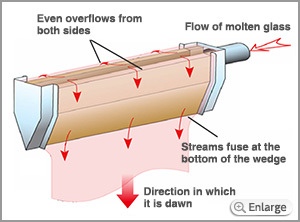 This squeezing force is compressive stress.Consequently, even if a force that would crack the glass surface is applied, the compressive stress cancels it out and stops the crack worsening. Thus, the glass is harder to smash. Dinorex is not just the ideal cover glass for smartphones and tablets. This advanced material also has the qualities required for many of tomorrow’s computer terminals and devices. Dinorex is not only shock resistant; it is almost perfectly clear and colorless, too. It does not affect image color or quality, so users can see images in their true beauty. Dinorex can be tailored for a wide range of sizes and thicknesses. Strengthened glass must be scratch-resistant and shock-resistant, and Dinorex T2X-1 offers both qualities to a high degree. What’s more, the chemical strengthening process takes 25 percent less time than conventional glass products. 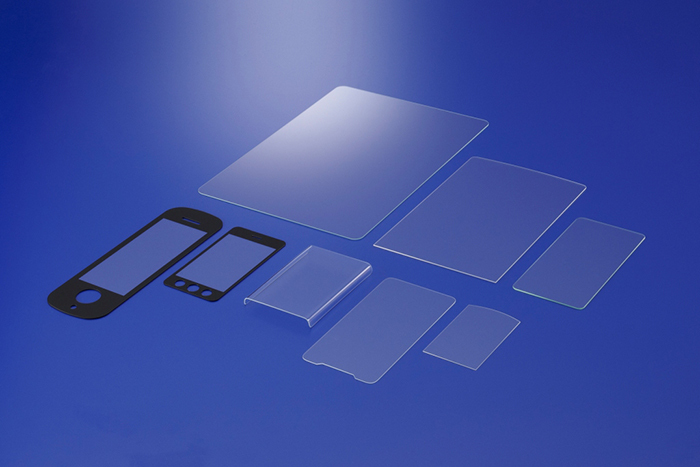 Dinorex T2X-0 was developed to be used for touch-sensor integrated cover glass. First, a large glass substrate is chemically strengthened. Next, multiple touch sensor circuits are made and integrated with the glass. Last, the glass is cut to size. At present, Dinorex T2X-0 can accommodate sizes of G6 (1,500mm x 1,850mm) or greater. 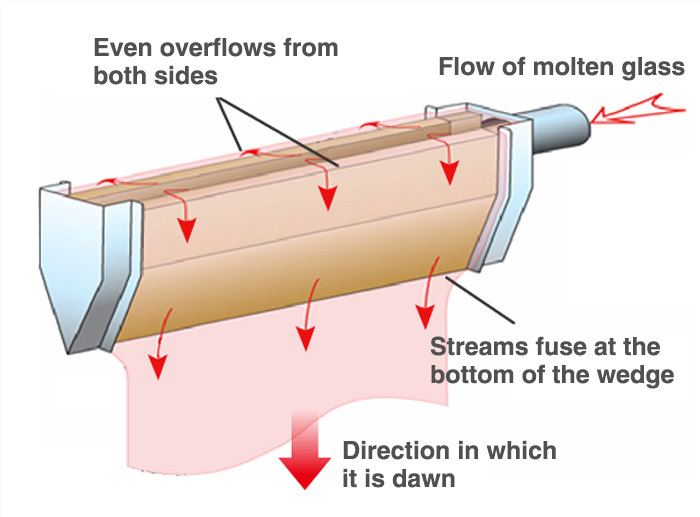 The overflow process enables larger and thinner glass with smooth surfaces. Using the overflow process of processing, we are able to make thin glass sheets with smooth surfaces that require no extra polishing in larger sizes. This process virtually eliminates warping of the glass after chemical strengthening, so it is ideal for manufacturing thinner and larger glass sheets. At Nippon Electric Glass, our constant quest to unlock the limitless potential of glass has led to the development of products and technologies that make a genuine contribution to society. Glass is suitable for diverse shapes and sizes. It has clarity, gas barrier properties, electric insulation, and chemical stability. These are just some of the qualities of glass that other materials cannot match. This all-round strength has seen glass used for an ever-broader range of uses since it appeared on the market. The rise of smartphones and tablets has not just changed the way we communicate; it has also revolutionized industries and lifestyles. But technical innovation is a never-ending process. At Nippon Electric Glass, we are determined to raise Dinorex to ever higher levels of quality and to contribute to better image communication. By leveraging glass’s inherent characteristics and functionality, we aim to continue satisfying our customers’ demands long into the future. 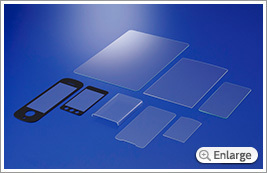 Copyright © 2000- Nippon Electric Glass Co., Ltd.